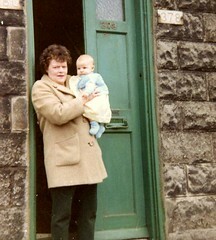 Here's a photo of me (looking not-un-Amaia-like) taken in spring 1968 with my Granny Jean. She would have been 95 today... had she not died 27 years ago. When I was born my parents lived with her and Gramps, so theirs was my first home. After we left when I was six months old, I visited her almost every weekend, staying overnight, until her death when I was 16. I remember her scabby, old pull-down bed in the living room. We used to lie in it on a Saturday morning watching Laurel and Hardy, Champion the Wonder Horse or Cowboy movies... all in black and white of course. She used to tell me stories about being a tomboy at school - in complete contrast to me, but ironically just like my daughter, whom she never met. She used to knit herself what seemed like the same cardie over and over in different colours and would take us shopping for buttons on Saturdays. She ate special k with raisins every night at bed time and washed them down with a cup of hot water in a clear cup! 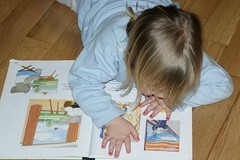 And she spent endless hours doing crosswords, always asking for a new little dictionary for Xmas or her birthday. One of my biggest regrets is that my Granny didn't live long enough to see me work for a dictionary company. I imagine sometimes how her face would have lit up in some parallel universe if I'd brought her home a copy of Collins Large English dictionary instead of the Gems I bought her as a teenager. I like to think she'd have been proud to see her granddaughter's name on the imprint page of so many dictionaries as the lexicographer. I guess people never really leave, they live on in your head forever. Thomas and I have both worked from home now since Léon was three. In the lifetime of a five year old, that's probably quite long. The other day one of his new classmates asked him home to play. His mother invited me along just to get to know another mum from the class. 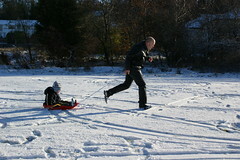 As we went to leave Léon said he wasn't ready to leave and wanted to play another little while. 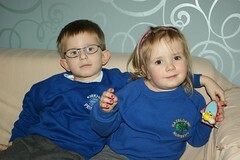 I explained we had to go because Fraser's mummy had to pick up his daddy from the station. Fraser doesn't have a daddy, mum. Léon replied. When I asked what made him think that, he replied that he'd been upstairs to play and there were no men working on computers in any of the upstairs bedrooms! He obviously has no notion of a parent going out to work and being missing for many hours a day. I guess he lives in a happy, safe world where the people you love are always on hand when you need them. I'm so glad the commuting days are over, for now at least. Charlotte is a wee bit of a logic-only vulcan at times, seemingly not seeing what everyone else would do in a given situation but only what makes sense. Yesterday when I picked her up from school it was a beautiful, warm spring afternoon. She remarked as she got into Thomas's car that it was filthy. Given the weather conditions she offered to start up her car-washing business that she had been running all last summer. I agreed. Given her wee pal Demi, who she ran it with, has moved away she asked firstly if she could be paid double this year as she'd have to do the jobs herself. I saw no issue with that. She popped outside and spent a good half hour washing Thomas's car, hosing and drying it. I went out and it looked great, gleaming in the sunlight. She started to pack the stuff away. I walked round it. The passenger side was completely untouched! When I asked why, she told me she needed to do some important homework that would take her till sunset and would wash the other half of the car today, or Monday! Given her availability, she thought that was a completely logical thing to do. She, of course, isn't the one driving around in a half-black, half-red car looking like a complete weirdo. I never understood playpens before. Why would you want to put your child in a small cage while you do the housework or cook? Surely that is just laziness? After all, how much harm can one small, angelic troll cause? Amaia has developed her own special method of crawling. It means she can lose things all round the house for you. She particularly likes moving one of each of her siblings' shoes to another room so they run about in a panic before school in the morning. After she discovered shoe moving, she progressed to book-shredding. Despite having all these kids and all these books, Amaia is actually the first of my children to realize you can take the books down from the shelves and rip off their front covers just to confuse the adults. She seemingly has a stash of (fortunately washable) felt tips somewhere that she uses to colour in the wooden floor boards whenever we turn our backs too. If one of the little ones drops a knife on the floor at dinner, Amaia instantly finds it and creeps about brandishing it menacingly. She does a mean impersonation of the Andrex puppy too these days. In the bathroom she alternates between puppy antics and loo-brush sucking. She has a great fondness for bin-emptying and of course eating the no-longer edible contents of bins wherever possible. But I think the thing I am finding most tedious at the present time is the fact that not only has she worked out how to take the lock off the Welsh dresser door where we keep the plates, but she takes them out quietly one by one, puts them all over the dining room floor and today has moved on to colouring in the insides of the bowls once again using her well-hidden felt-tips. The most astounding thing I find is that almost every time we find her in a compromising position, both Léon and Anna are in the room with her and it never occurs to them to tell her off. What's your sister doing guys? Ohhh, emmm colouring in the floor I think! I haven't played at cloning since Léon was a baby. 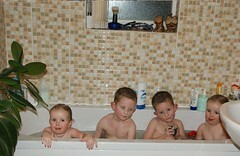 Last night while sitting with the kids editing some photos I noticed I had taken three photos in the bath which lent themselves to a quick cloning job. Once I was done I showed the photo to Léon and Anna. Who's that? I asked. Léon looked along the line Anna, Gordy?, me and Amaia? He asked, dubious. No, look, that's not Amaia! I pointed out. He looked even more puzzled and ventured Charlotte? When I asked him which of the Léons was Léon he was dumbstruck. Eventually I explained it was Anna, Léon, Léon and Anna. I asked if he remembered me taking it. He was utterly speechless. Eventually after a few hours he asked if the whole thing might have something to do with scissors and glue! Finally his brain was starting to comprehend it was a trick photo, but it took a while. We came across the book Babar's Gallery in the play area of Glasgow's Museum of Modern Art the other weekend. It is very obviously based on the Musée d'Orsay in Paris. Many of the paintings redrawn inside are from the Orsay from what I remember, others are simply extremely famous paintings we all know. The kids were drawn to it in the gallery, so we bought it on Amazon used for next to nothing. Léon and Anna can't get enough of it, constantly asking us to show them the real work of art on google and comparing both. Anna is particularly taken with Babar as Munch's Scream, even going as far as asking what is making him scream and wondering what the elephant might fear. At this rate they'll be able to pass a university exam in History of Art by the time they reach primary 2! I'd definitely recommend it highly to anyone who'd like to get their kids interested in art. Today when I dropped Anna off for her 2 hours and 45 minutes of free state nursery care, I was handed a letter from the council. The director of education was offering me a holiday cover place for the ten days the nursery is closed at the beginning of April for 'just £32 a day'. It got me to thinking about childcare costs again. Calculating what it would cost me to have all my kids looked after for say the seven weeks of summer holiday alone is of course laughable (£4385.20 if we used the local private nursery for Amaia and the council summer clubs for the other four) but imagine I only had Léon and Anna which is a fairly normal family, right? They still expect me to pay £32 a day for Anna and £29.80 a day for Léon to use the council summer scheme, in other words £2348.40 for the seven weeks and three days they are off in summer.) How is this supposed to work in a city where the average salary is in the low £20k bracket? If you should ever happen to bump into me in an airport here or abroad with my kids and you wonder why I am having a fit of the giggles at passport control, just remember this scene. In order to get the required 'cream background with no shadows' on his passport photo, my poor adolescent son was forced to lie between my legs looking where he probably would rather not, while his younger brother distracted him with a giant happy sunflower. And to think most people simply pay a few quid to sit in a boring booth - how conventional! There are certain levels of cuteness that are hard to achieve after the age of about three. Take this situation, for example... not many people over the age of three manage to fall asleep onto a cushion while standing beside a couch and land so comfortably that they actually remain standing for the entire duration of their sleep! 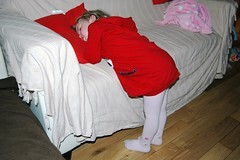 Anna spent a full ten minutes asleep standing up in our TV room before Thomas carried her off to bed. I missed it, being in the bath, but fortunately Charlotte had the presence of mind to take the photographic evidence I needed! Awwwh, bless her cotton socks! I got a box of these biscuits for my birthday last week and they were so good I thought I would recommend them to everyone out there! Creamy, lemony, melt-in-the mouth - delish! I was in town on Saturday and Léon was moaning that he didn't have slipper socks like those I'd bought his sisters last week. Given they are only £1.50, I promised him a pair. He is given to imagination and lives in his own fantasy world at times but there was one side effect I simply could not have foreseen. 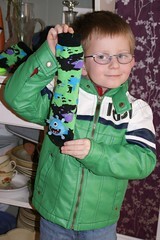 As soon as he put them on, he informed me that the monsters on the front of the socks were tidy monsters and were appalled at the mess in the house. He told me they wanted to tidy up the toys that were lying around. He picked up all the toys in the dining room. I figured he'd run out of steam soon enough but half an hour later I heard him telling Marcel to lift his feet in the TV room, next the kitchen, living room and hall were blitzed. At lunch time I thought he'd gone missing till he was seen backing out of my bedroom with a broom in his hand!! It was too good to be true. His own room was next, then I heard him shouting at both Marcel and Lots to let him in to their bedrooms! I was speechless by the time he forced Thomas upstairs into his office and kept him there for half an hour! After that the monsters were satisfied, so it looks like I've been left with two halls and all the bathrooms to do myself but on the balance I am defintely liking his £1-50 socks quite a lot!!!! Isn't this just a priceless photo? 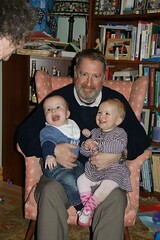 Wee babies really love their grandparents, don't they? I don't think I've ever had a child who takes so much pleasure out of feeding herself her own dinner. 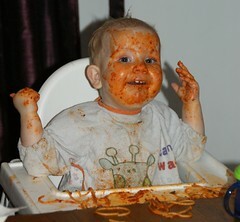 The highchair did need to be dismantled and bleached afterwards but she just loved the independence of feeding herself three whole bowls of spaghetti with tomato sauce! Mum took one look at the series of photos on flickr and remarked she'd out-messied even my messiest child! What a good new word! 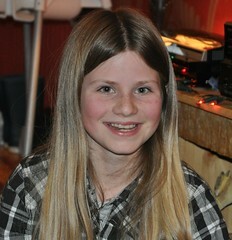 I was in town last Saturday in Primark with Karen buying slipper socks for Amaia and some tights for Anna. I returned home and Anna looked more pleased than I expected when I entered with my large, brown, paper Primark bag. She skipped towards me expectantly and said, almost singing 'I know what's for dinner!' Odd, I hadn't been to ASDA yet. 'Fish and chips!' she explained... I forgot that to a child who can't read, a Primark bag looks exactly the same as the brown, paper bag Granny and Pumpa had bought her fish and chips from the local chip shop in last week! Her tights turned out to be a bit of an anti-climax after that.